Today’s unique classes and training options make exercise fun—and the prospect of an exciting workout may be just the motivation your clients need to get moving. Since many people turn to RDs to help them lose weight or improve their lifestyle, it’s important that nutrition professionals are clued in to the latest fitness trends. A balanced diet and regular physical activity should work together to promote healthy weight loss and overall well-being. Bloom says it’s a great idea to build relationships with trainers in your area, even if you don’t work out of a gym. It’s an easy way to gain new business, as the trainer will appreciate your recommendation and may refer his or her clients to you for their nutrition needs. 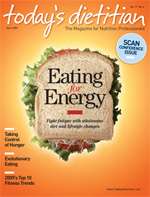 Offering clients information on the latest trends is one way dietitians can get them interested in physical fitness. The American Council on Exercise (ACE), the country’s leading authority on fitness, recently released a list of the top 10 fitness trends for 2009. The research was compiled through a survey of ACE’s network, which includes personal trainers, group fitness experts, and lifestyle and weight management consultants. Budget-friendly and boot camp-style workouts both topped the list this year. ACE’s top 10 list follows, and Today’s Dietitian has included helpful advice you can share with your clients and patients. Silber adds that the intensity of these programs may overwhelm some clients and that they aren’t right for everyone. Also, boot camp-style workouts shouldn’t be the only style of exercise clients perform; if they are, clients may quickly become exhausted and frustrated. “If this is the only type of workout and there is nothing more moderate incorporated into the routine, the client may abandon their efforts because of being unwilling to perform at such intensity each and every time,” she says. The current state of the economy is affecting the fitness world, too. Because families are limiting their spending, research predicts more people will cut the cost of staying in shape. Forty-eight percent of participants in an ACE survey predicted gym memberships will decrease over the course of this year, and 52% said less people will hire personal trainers. Your clients who are interested in fitness will likely be looking for cheap ways to work out. ACE reports that favorites such as yoga and Pilates will remain popular, but dance-based classes and programs have emerged as the latest trend. Many of these classes and programs are combining fitness with dance techniques. Yoga Booty Ballet, an at-home DVD program that has become fashionable, is a cardio workout that combines yoga and dance with glute-sculpting techniques. Also popular, reports ACE, is Zumba, a fitness program inspired by Latin dance that combines South American rhythms with cardiovascular exercise. One reason why these types of classes are in vogue may be the television show Dancing With the Stars. Dance workouts are also quite popular among celebrities. During circuit training workouts, it’s important to maintain proper form and techniques, especially since it can be fast paced and getting hurt is always a possibility. “If the client is more interested in getting through the circuit at the expense of proper form and technique, injury can occur,” notes Silber. A kettlebell is a traditional Russian weight that resembles a cannonball or a bowling ball with a handle. It has become a popular tool for both men and women to increase strength, endurance, agility, and balance. ACE believes the reason for the surge in popularity surrounding kettlebell training is because it gets back to basic training that requires functional, whole-body fitness. Kettlebell training is particularly effective for strengthening the core, since it requires those muscles to contract as a group. It also forces an individual to focus on whole-body conditioning because lifting and controlling the kettlebell in various workout positions require using multiple muscles. It's a great way to develop strength and stability, and the varying routines keep the workout more interesting than standard dumbbell training. Even as technology makes rapid changes in the way people work out and trendy workouts become all the rage, sports continue to be a popular way to stay in shape. Participating in a friendly game of basketball at the Y or taking a day-long bike ride at the park are just a couple of ways that people will stay in shape in 2009 and have fun while they’re doing it. According to ACE, traditional programming is changing from what is called “linear progression” to “undulating.” In other words, people are mixing up the types and styles of workouts in which they participate. Research has shown similar if not better results in exercising this way. Mixing low-intensity cardio with intervals on some days and then mixing high-volume, low-intensity weight training on other days can keep things interesting while also yielding positive results. And if people are enjoying themselves and not growing bored with their routine, they’ll be more likely to stick with it. Sharing some of these trends with your clients may help motivate them or give them ideas on how to become more physically active. Just be sure to recommend that your client see a physician before getting started, especially if he or she has any risk factors for heart problems, has had an injury or a recent surgery, or is an older adult.